This was the first thing typed over to me in the scrappy in-game chat of SpyParty, the multiplayer espionage game that just released on Steam Early Access, its first time on the major platform. The game's been in development since it made an appearance at the Experimental Gameplay Workshop at GDC 2009. Developed by Chris Hecker and artists John Cimino and Reika Yoshino (an environmental artist who worked on the game for a year and is now at thatgamecompany), it has been in beta since 2011; first closed, later public in 2013. The game's been a roaring success while still in development, even popping up at EVO in 2012. The following it's fostered has been passionate, keeping the game alive during its long-development cycle. "Yup. First time," I write back, like a sheepish teen about to lose their virginity in a loveless hook-up. It was obvious. My in-game name was just an assortment of numbers with "Steam" next to it, unlike their carefully chosen username. They tell me good luck in a flash and after a brief load time, we're in a match. I'm the Spy, and they're the Sniper trying to guess who I am and take me out. It's my job to accomplish my assigned missions—seduce a party goer, swap out a statue, make contact with my double agent, and bug the ambassador—undetected in a relatively short amount of time. I lost. A lot. After some kind platitudes, I left the partnership and was promptly invited to a new match from the main lobby by another stranger. This time, I told myself, would be different. I'll win. Instead, yet again, the match ended fairly quickly because I'm an idiot. After pretending to read a book as I loitered by a bookshelf, I made a beeline over to the statues. The laser sight of the Sniper, an omnipresent thing on the screen for the Spy player, was not focused on me. I felt a weight off my shoulders. I was in the clear. I picked up the statue, ogled it for a bit, and made the switch; and then, I was sniped and dead. The Sniper had won. "Sorry," they write after as we loaded up another match. "Saw the swap." I write back that it's all good—I had been naive, not thinking about their peripheral beyond the laser-focused target of their sight. "That's a hard mission tbh," they type back, to reassure me. "The swap." As a Sniper, players have an outside view of the cocktail party (whichever map it may be on, whether it's a skyscraper or a classy bar), and have the option of zooming outward and inward at their leisure. With another load screen, we were back in the mix. I was the Sniper this round. 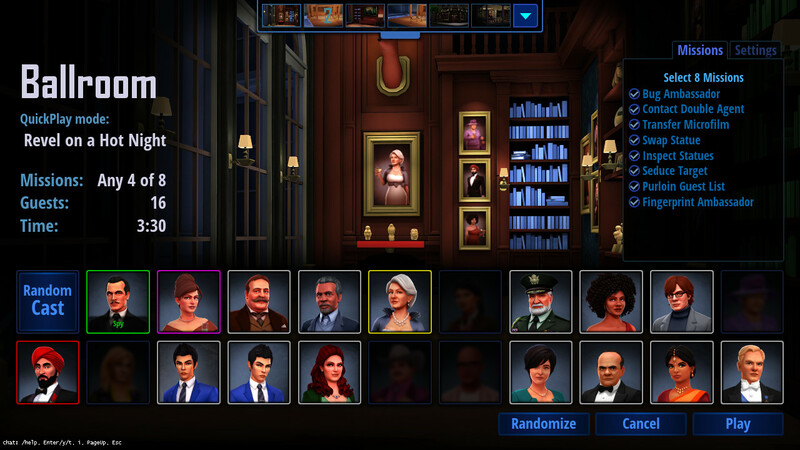 SpyParty is unlike any other multiplayer game I've ever played. Perhaps stupidly, I figured that being the Sniper would be the easier half of the competitive equation. Observing NPCs to spot who the real person was? Piece of cake. I learned quickly that this is not the case. Each NPC acts as if they have their own driver behind the wheel, their own tasks to accomplish, their own minds. Some will linger around windows, checking their watches casually as if they're itching to leave the cocktail bash. Others will sip their drinks nervously in conversations. Some will pick up statues for no discernible reason (like the rude friend of a friend at a house party that touches your belongings without asking first). These are all actions meant to shake the Sniper up. If a Spy checks their watch by a window, it boosts up their timer to complete their missions. 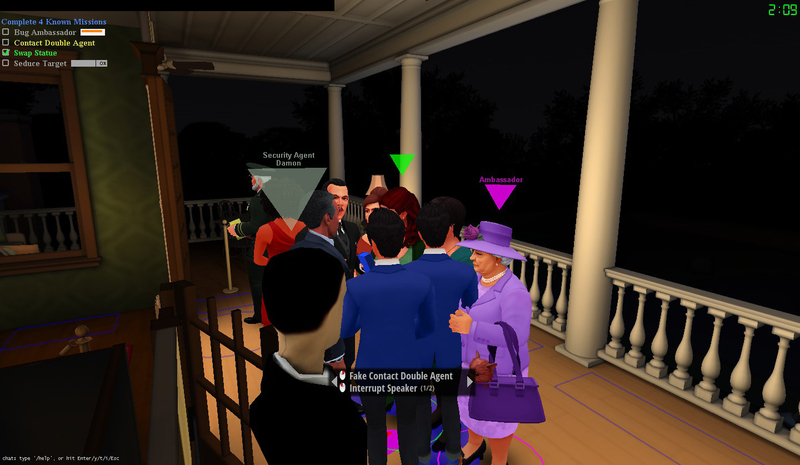 If a player is entrenched in a busy conversation, they can drop the code word (either to trip up the Sniper or to pass along the message to the double agent—of which the Sniper sees a few potential double agents highlighted at all times, unknowing of who the true one is) or bug the ambassador attendee. If a player picks up a statue, they can swap it for a phony. Every action can have nefarious intentions, and it's up to the Sniper to spot it. And with many NPCs constantly replicating these actions, catching the other player red-handed is tougher than it may initially seem. It's because in most cases, there's no telltale sign that a NPC is the Spy. The Sniper has to be vigilant: from knowing the precise statues that were there to spot the swapped one, to paying attention to who's talking to who at any given moment, to even managing their own suspects and cleared guesses through highlighting and lowlighting attendees—an essential strategy. SpyParty is a game that throws a lot at the player at a glance, but the more I played, the more comfortable I got in both the Sniper and Spy roles. Before I knew it, I was successfully pulling off guessing who the Spy was, or watching an innocent civilian at my side be killed with the Sniper's single bullet in my stead. This conversation is poppin' off. "Good job!" this particular stranger I was playing with typed back after my first successful run as a Spy. I grew convinced that this random player, who seemed to be a veteran beta tester carried over to the Steam version as per their proper username, was maybe one of the nicest randos I've ever played any game with. And of the many different games I played on the beta's ten maps with different random players, I realized that a lot of the veteran players I seemed to be playing with were adopting the roles of makeshift mentors. I thought back to their reassuring gestures and suggestions and the congrats granted after a particularly long match. It's something that I wonder will either get more common as the playerbase grows with the Steam Early Access launch, or go in the opposite direction because of its broader reach. I hope it's the former. The game luckily has a tutorial to teach new players, with potential for single-player and other multiplayer modes to be added in the future (though in the Steam Early Access page, developer Hecker notes those aren't priority and are riskier endeavors before perfecting the game's core 1v1 mode). There are more missions and maps than what the game's tutorial lays out too. And the better you get, the more confident you can be in executing additional and harder missions, like attaining a fingerprint. The skill level in SpyParty is one that seems almost alienating initially—hence its EVO experience even before it had the nicer character models that it has now. And yet, in the hours I've played so far, I feel like a player that can maybe hold her own against some of its veteran beta testers. Every loss is a lesson, just as every win is too. SpyParty doesn't seem like it's leaving Early Access anytime soon, as polished as the core experience may feel right now. 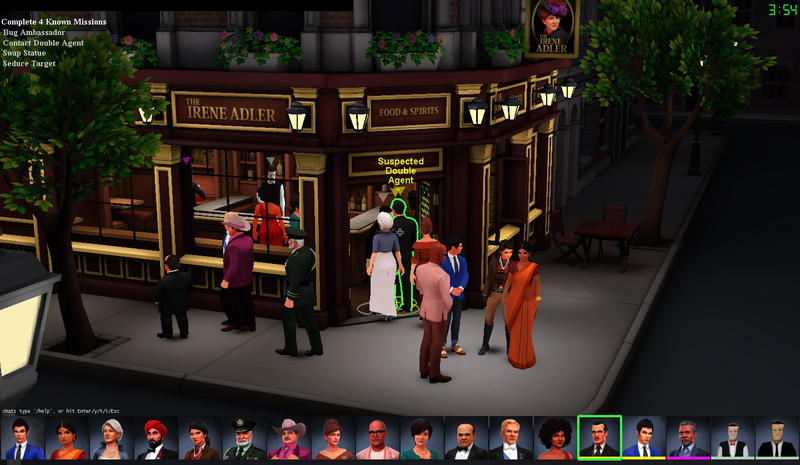 The game still has the usual bugs and mishaps that most Early Access games are bound to have, though SpyParty's are few and largely just consist of awkward NPCs bumping into one another, or crowding around a single conversation circle. On the Early Access page, Hecker predicts that the game will remain in Early Access for "about two years" due to his pesky perfectionism. If that perfectionism leads to more maps, tricky missions, and lovable potential Spys to embody, then unlike the plot of seemingly every single Mission: Impossible movie, I don't think I'll disavow this game anytime soon. Tagged with Analyses,	Chris Hecker,	Indie,	multiplayer,	PC,	SpyParty,	Steam Early Access,	Strategy.